I'm writing about Zujava because it conveniently puts my "catagory" list with a range from A – Z. Prior to that I had to settle for Wizzley as my last word. Coincidentally both of them are online writing sites, both of them appear to have spun off from Squidoo lensmasters, and both of them seem to have the same people contributing. Followers of this blog will be aware that I have a bee in my bonnet about coconut water. I wrote a Wizzley page about it recently, which has garnered substantial interest. Meanwhile I was looking at my Squidoo lens on coconut harvesting and saw a Google adsense link to coconut water. I clicked on it out of curiosity and it brought me to a UK company selling the magic nectar. "Coconutty" says in their blurb "There’s a revolution happening – from Madonna to Rihanna, from marathon runners to premier league football teams, coconut water is now becoming mainstream. More and more people are opening their minds and mouths to the incredible hydration of pure coconut water. Once the secret of the tropics, coconut water is now being embraced everywhere as the new sports drink of choice." 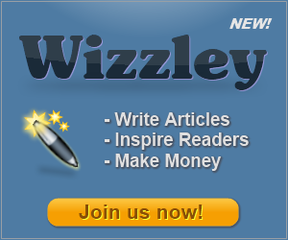 Wizzley is an online publishing site similar to Squidoo and Hubpages. The model is more geared to the latter. I've always found Hubpages much simpler to create content, and Squidoo has developed so many tentacles in recent times that they appear to be getting knotted with their own appendages. Whatever is going on at Squidoo is not for me to figure out, but when they started giving out cartoon characters similar to kindergarten cuddly toys as trophies, it was time to cut and run. As a Squidoo pioneer I was awarded with some kind of demented gremlin high on speed. I regarded it as contemptious and pathetic. Surely they could have thought of something better? It gets worse – take a quest which I have been invited to complete: "Duncan Diggity is coming up short of ideas for a fun summer vacation for his wife and squids. Help him by creating a NEW travel lens and you'll collect 200 SquidPoints." Wow – goody goody, can't wait to play with Duncan Diggity!! But back to Wizzley. The founders have clearly looked at the aforementioned and attempted to strike a happy medium. As with all, the emphasis is on affiliate advertising, so Amazon, Youtube, ebay, Zazzle, et al are fundamental to a page. As with Hubpages, Wizzleyers (wizzlers?) are expected to have independent affiliation with the advertisers, even down to the google adsense – unlike Squidoo which mainly pools it all and distributes it in their own peculier way. There is no question that Wizzley has learnt some lessons and is attempting to incorporate the best of what's available, nor is there any question, which they may deny, that they are poaching Squidhubbers. They would no doubt argue that they are just creating another sea to swim in. After all, that's what competition is all about. But loyalty manifests itself in several forms, and whilst many may be tempted to dip their toe in the water, how many will actually swim? Old habits die hard, and although some may jump in at the deep end (writing lots of Wizzley's, gathering fans etc), surely the mercenary will just see an opportunity to promote their established work which is elsewhere? Is this a recipe for opportunism, or a genuine alternative to create refreshing new content? Its early days, and too early to see what the financial returns may be. Nevertheless, there is room for Wizzley, and the chance to regain a healthy and personal community long lost from the original idealism of Squidoo. It took less than four years for Squidoo to lose its compass. Lets hope the navigators at USS Wizzley have a greater sense of direction. I will be on board, and will support it. I just hope I don't feel the need to jump ship in three years time. But by then I may be pushed anyway.